I have not tested this pattern beyond its original design. But... Faith Fidler was nice enough to help me out with my directions. Changes have been made in blue... see below. Also, if you have difficulty with this pattern please let me know. Many Thanks to Roslyn Francis for helping me simplify Round 22. The following pattern is my original design and can only be copied or printed for personal use. Yarn: Any 4ply worsted weight yarn. Red Heart yarn works really well. Stitches used: ch, sl st, sc, rev sc, dc. BIBLE SIZE: 5 3/4" x 8 3/8 " x 1 1/2" thick. ROW 1: Ch 27, sc in 2nd ch from hk and in each ch across. (26 sc), Ch 3, turn. ROW 2: *Sk 1st sc, dc in next sc, dc in skipped sc (cross dc made), repeat from * across. (12 cross dcs). Dc in last sc, ch 3, turn. ROWS 3-19: *Sk 1st dc, dc in next dc, dc in skipped dc. Repeat from * across (12 cross dcs). Dc in last dc. Ch 3, turn. ROW 20: *Sk 1st dc, dc in next dc, dc in skipped dc. Repeat from * across (12 cross dcs). Dc in last dc. Ch 1, turn. The following is a round, not a row. You will be working all the way around the piece. RND 22: Work 2 scs around the post of each dc along the row ends. Work one sc in each unworked loop along the foundation chain. Work 2 scs around the post of each dc along the row ends. Join with a sl st in the first sc on Rnd 21. Ch 1, do not turn. ROW 1: Ch 27, sc in 2nd ch from hk and in each ch across. Ch 1, turn. (26 sc). ROWS 2-15: Sc in each sc. Ch 1, turn. (26 sc). RND 16: Sc all around the piece. Join with sl st, ch 2, turn. RND 17: Hdc in each sc, 3 hdcs in each corner. Fasten off. Braided in one piece makes two markers when attached. Cut 3 strands of yarn approximately 2 feet long and tie a knot in one end. Braid the 3 strands to the end and tie another knot. Fold in half in the middle to form a loop. 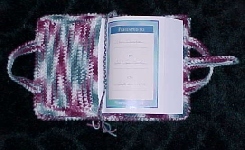 With the outside of the bible cover facing you, and using the hook, draw the folded end (the loop) of the yarn up through the stitch to which you'd like to join a your marker and pull the loose ends through the folded end. All you need to do is tighten up the knot by pulling on the ends of the braid. Working down opposite side, sc in each rem lp of ch and do an extra sc in the last lp, join with a sl st. Ch 1, DO NOT TURN. ROW 2: Going clockwise, rev sc in each st around, placing 2 rev scs in each end of latch. Working down opposite side, sc in each rem lp of ch and do an extra sc in the last lp, join with a sl st.
ROW 2: Going clockwise, rev sc in each st around, placing 2 rev scs in each end of latch. Ch 1, DO NOT TURN. Sew to Bible cover using the Illustrations as a guide for placement. Ch 3, 6sc in 3rd ch from hk, join with sl st. Fasten off.